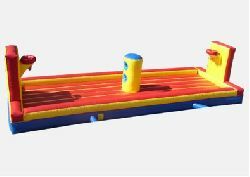 Inflatable bungee games are inflatables that provide a safe platform where competitive play is made challenging by restraining bungee cords! 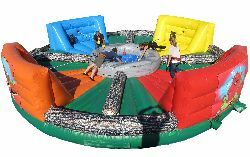 Perfect for exercise and active play, they are kept inflated by one or more electrical blowers that plug into standard household outlets that are ground-fault protected. Players compete against each other or just test their skills before bungee cords pull them back. 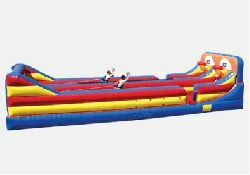 Lots of fun mostly for older kids; age and size guidelines are provided when requesting a quote.